The Hiryu is a fierce feathered dragon that mostly resembles a giant bird. 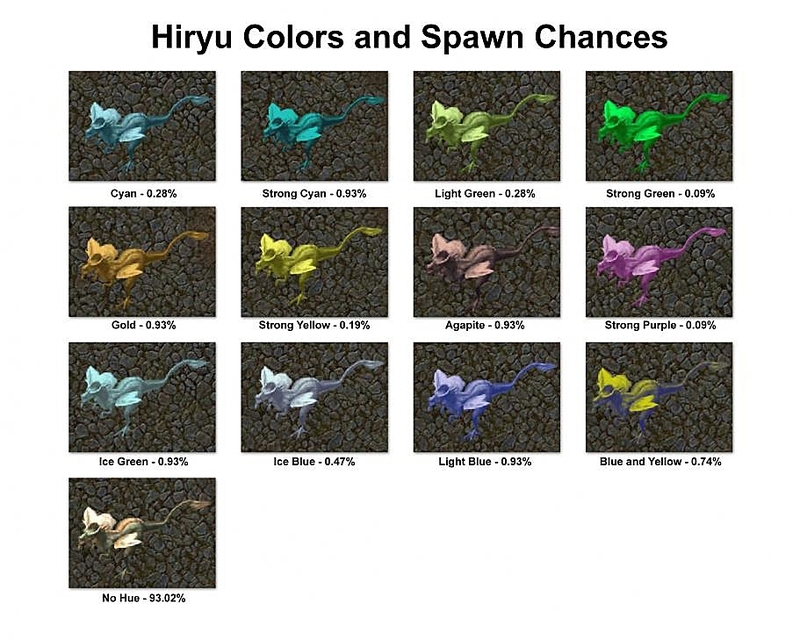 The feathers of the normal Hiryu can be one of several different colors which can be seen here: Classic Client or Stygian Abyss Client (Thank you to Tina Small for the images). Most will only be the normal grey and red. The Hiryu is an extremely powerful creature and single blow from its claws can render your physical resistance useless, or it could just knock you off your mount if you were on one. Unlike most other dragons the Hiryu does not have a breath attack, nor does it have magic abilities, but its raw strength more than makes up for that. Although it might take a while, it is possible for a skilled animal tamer to tame the Hiryu. Beware however, the Hiryu is easily angered and will usually not come just because you ask it politely. When it is tamed, the Hiryu will have most of its stats halved. Special: Bonsai Seed, Fragrant Seed, Peculiar Seed. Taming Notes: Requires 4 Control Slots.